This summer, North Brooklyn seemed suddenly littered with ads, sprawling billboards: “Mitski’s BE THE COWBOY, stream it now on Spotify™.” Cowboy boots scuffed up the L train. Grown men wore “Makeout Creek Parks & Tourism” sweatshirts (a reference to Mitski’s third record, Bury Me at Makeout Creek) in eighty degree weather. And yet, despite all this, Mitski fans were still surprised when she sold out Brooklyn Steel (an 1,800 capacity venue) four nights in a row (November 30th, December 1st, December 2nd, and December 3rd). It was only two-ish years ago, after all, that she was playing modest college gigs. What changed to bring about this mass appeal? Time hasn’t altered Mitski’s image that much. She’s always been fascinated with romance, rebellion, and celluloid womanliness. 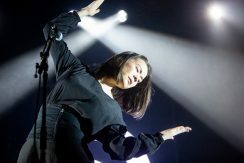 Even if the press photos and videos for Be the Cowboy seem uniquely fixated on a cinematic diva aesthetic, these only expand upon the persona Mitski established in her last album’s videos. Be the Cowboy as a title renders the Hollywood cowboy the epitome of Mitski’s career-long persona—a persona that has always looked to the camera. The lonely, camera-ready beauty in the “Your Best American Girl” video is the same starlet posing in the “Washing Machine Heart” video, just without the chiaroscuro look. So the night of her Saturday Brooklyn Steel concert, I was thinking about what it means that Mitski may now be confronting the same celebrity her persona pokes fun at. In other words, I was wondering whether she would emerge as that proverbial cowboy. I arrived at the venue in time to see the openers, SASAMI and Downtown Boys. I hadn’t seen either in concert before, but I knew their music and looked forward to hearing them live. SASAMI (an L.A. rocker previously of Cherry Glazerr fame) kicked off the show with a tight, high-energy set. She swung her hair around, cracked some jokes, belted with infectious intensity. The audience knew “Not the Time” and “Callous,” which she released as a 7” on Domino Records last spring, but cheered for her other grittier songs just as loudly. Her band as a whole embodied that post-punk butch confidence that’s impossible not to adore. But Downtown Boys (a radical Left punk band from Rhode Island) raised SASAMI’s intensity tenfold. Between songs, lead singer Victoria Ruiz delivered full monologues about the violence of borders and how neoliberalism is a self-immolating phenomenon. During “A Wall,” the audience joined in as the band yelled, “A wall is just a wall / and nothing more at all!” The chant vibrated Brooklyn Steel’s industrial edifice. These openers lent Mitski’s music an unexpected context: they highlighted her own punk-ness. Following Downtown Boys’ set, I realized that Mitski has changed over time, that her punk sensibilities have adapted to a scene that loves beautiful singing, lush sounds, and romance. Whereas before Be the Cowboy, her voice hid behind crunchy, almost lo-fi arrangements, now her voice shines through, complemented by sparkling orchestrations. She holds onto the short track lengths, punchy lyrics, and general unruliness of her previous work—the kind of unruliness that justified her literally screaming into her guitar, as she did in her 2015 Tiny Desk concert—but crystal-clear tracks like “Nobody” and “Washing Machine Heart” have made her punk form more accessible. She made grittiness attractive to popheads, and this perhaps explains certain scowls behind me during the openers’ sets. Just before Mitski walked out, the crowd swelled and grew younger—a middle-aged Downtown Boys stan in front of me left, and I noticed a couple red-faced fifteen-year-olds walk in with their mothers. Two college students (likely NYU) moved in beside me and joked about how they were about to see Mitski from the bottom of a K-hole. Then three white beams of light fell on the stage. Mitski, dressed in all black, stepped out. A girl in front of me fainted. The crowd screamed. Mitski approached the mic, front and center, conspicuously far in front of her band. The opening chords of “Remember My Name” blasted through the speakers. Mitski, sans guitar, sang effortlessly into the mic. This was not one of her most popular songs, but it seemed everyone knew every word. I could barely see, so many arms were flailing around. Next she sang “I Don’t Smoke” and performed unsettling devised movements as looping videos played on the triptych panels behind her. The lights dimmed. Her hand formed a gun. She dragged the barrel down her body. The crowd cheered. As the set continued, her selections oscillated between the old and the new, covering as much of her two previous albums as Be the Cowboy. Meanwhile, she set out to cover the whole stage. She stretched out her arms and contorted her hands in precise, rhythmic motions. She took the mic stand away and anxiously paced back and forth, knelt down in despair, spun in front of videos of bright orange flames. During “Drunk Walk Home,” she fell to floor and convulsed as if possessed. Truly there were many such eerie moments, each insightful, each revealing how Mitski’s melodies frustrate her lyrics, how she examines kinds of emotional pain that manifest themselves as excitement. She performed “Nobody”—a song about loneliness with a happy, catchy melody—and the entire audience sang the chorus in disturbing unison: “Nobody, nobody, nobody, nobody, nobody…” Some people jumped up and down. Many were smiling. The loneliness that “Nobody” captures is as claustrophobic and manic as we were, as high-energy as a concert crowd. To bring us back down from this, Mitski brought out her guitar and played her last two songs, “Burning Hill” and “My Body’s Made of Crushed Little Stars,” solo. She stumbled a little during “Burning Hill,” as surely the new intimacy (the intimacy of presenting herself all alone on stage) was nerve-wracking. But she played “My Body’s Made of Crushed Little Stars” fearlessly, with her whole body, fully the cowboy. Admittedly the show was long—three and a half hours with openers, an hour and a half without—but the crowd’s energy kept up, and perhaps this speaks to Mitski’s starpower (which proved itself many times over). But it also speaks to the healing powers of her manic, punk sadness. As creepy is it is, singing along to another person’s heartbreak in a space that reproduces and magnifies euphoria is pretty cathartic. More importantly, it’s a kind of solidarity. The experience is its own scene, its own kind of punk. It shatters the camera lens and drags the cowboy out into the real world, the complex and unstable world, exposing all his truths and affectations, his anger and unbecoming loneliness.